Although we don’t have pumpkin spice on the menu, we are bringing you some great fall flavors with this season’s new menu. As you know, our promise to you, our guest, is to provide you with freshest ingredients that are seasonally available. This autumn we are doing that with pumpkin, sweet potato, persimmon, and cauliflower just to name a few! Sweet Potato Beignets. These little sweeties are snackable enough alone but when you add pulled duck from Joe Jurgielewicz & Son, persimmon, celery and a curry anglaise it becomes a party in your mouth! Crispy Brussel Sprouts. They’re back! 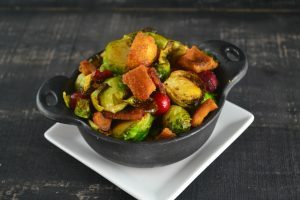 It’s not really fall until Brussel sprouts come back in season and with sticky bun and cranberry, this dish is a staff favorite. If you haven’t tried them yet, what are you waiting for? Country Fried Boar Chops. We’ve turned classic country fried steak on its side by using boar! Served with a ham hock gravy, shishito pepper polenta nd green tomatoes this twist on a Southern favorite is sure to get you talking. Middleswarth Chips Mac and Cheese. Seriously, how can you elevate mac and cheese? We give it a go with another local favorite, Middleswarth chips! Locals know that these are the go to chip for picnics and barbecues and as a crunchy topping on our cheesy rotini with bacon they hold their own. Diver Scallops. Diver scallops are well known as the freshest and best scallops on the market. They don’t need more than a simple potato and mussel salad with some heirloom vegetables to really shine. Of course, it helps to have pristine seafood from Mechanicsburg-based John Gross & Company to work with. 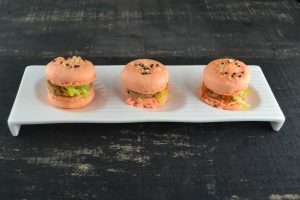 Chicken Liver Mousse Macaroons. Say what? That’s right, we’ve taken the delicate French cookie and given it a spin with a savory chicken mousse filling complimented by the flavors of pumpkin, passion fruit, and sesame. Different? Yes. Delicious? Oh, yes! Whether you choose an old favorite or decide to try something new, Ad Lib’s Fall menu and open flow kitchen concept are perfect for a fun night out with old and new friends. Be Spontaneous! For reservations, call 717.237.6419 or make a reservation online!